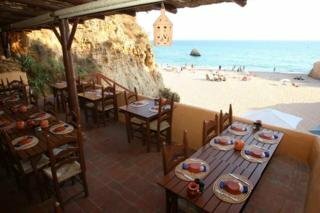 Situated above the fishing city of Albufeira, 2 km from the historical centre. The Albufeira Jardim is a 3-star property situated above the fishing city of Albufeira and surrounded by its own gardens. All the apartments are equipped with complete bathroom.. It Has 2 Buildings And A Total Of 4 Floors And 211 Apartments. Guests Are Offered ), Safes For Rental, A Currency Exchange Desk And A 24-Hour Reception. Furthermore There Is A Internet Access Computer At Reception. 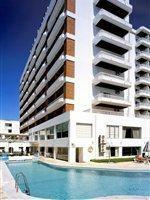 Albufeira Jardim I & II Apartments are situated in a peaceful location just 700 metres from Albufeira beachfront. Situated above the resort of Albufeira, in the Algarve, these basic apartments are set in spacious grounds and have 243 simply furnished..
Santa Eulalia: Child friendly, comfortable holiday development "Aldeamento Alfagar garden view T1 (2 pax)", 3 storeys, built in 1988, renovated in 2009. 210 apartments in the property. In a sunny position, 100 m from the sea. For shared use:.. 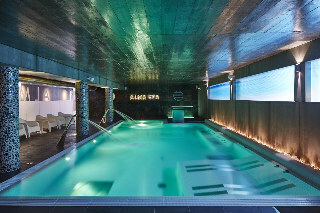 This hotel is located only a short stroll from the beautiful sandy beach of Praia da Oura and within walking distance to the centre of the popular holiday resort of Albufeira with its numerous restaurants, bars, pubs and shops. Several other sandy beaches.. This apartment hotel complex is only 30 km away from Faro International Airport, 8 km from Albufeira historical city, 500 metres from the Falésia Beach, 200 metres from public transport links and 100 metres from a shopping arcade and a supermarket.This..